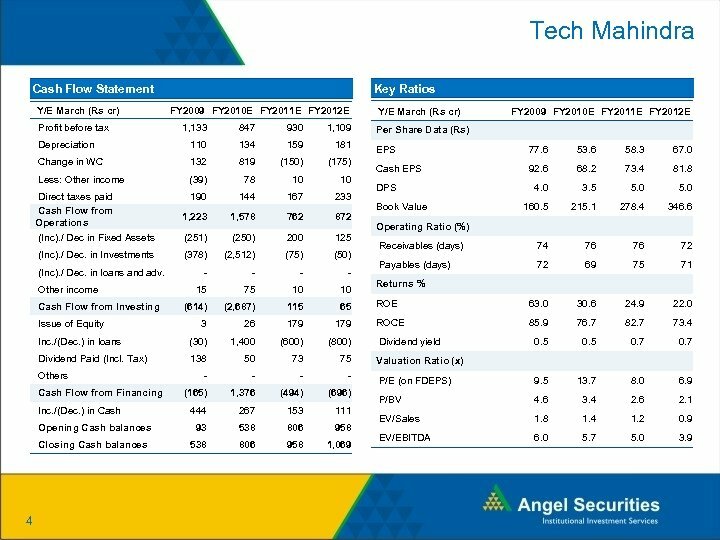 Tech Mahindra SOTP Valuation of Tech Mahindra Economical EV/Sales despite comparative margins. 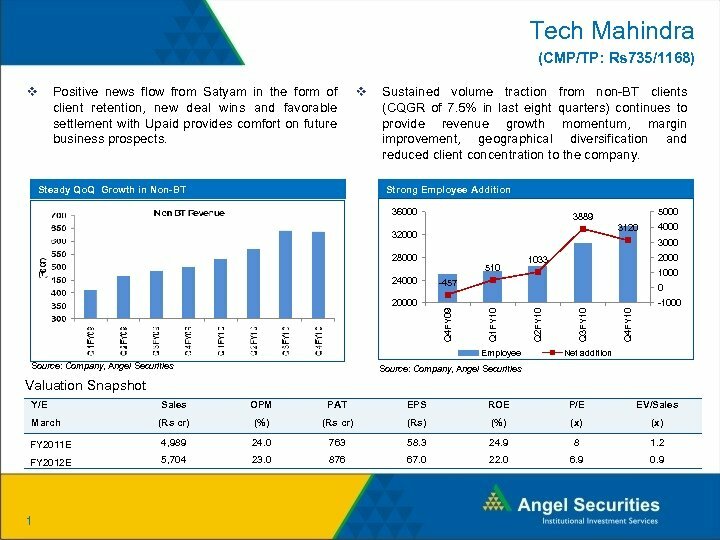 (TTM) Rs in cr Tech Mahindra MCAP Value of stake in Satyam Assuming 30% discount Standalone MCAP of Tech Mahindra FY 12 Net Profit of Tech Mahindra Standalone Current PE of Tech Mahindra (x) Target FY 12 standalone multiple (x) 9, 120 4, 626 3, 192 5, 928 876 7 13 Target MCAP of Tech Mahindra Standalone 11, 300 Value of Satyam stake Target MCAP Target Price (Rs) 3, 192 14, 492 1, 168 Source: Company, Angel Securities v 2 40% 7 6. 2 35% 6 4. 9 30% 25% 5 3. 5 4 20% 2. 2 15% 3 2. 1 1. 4 10% 1. 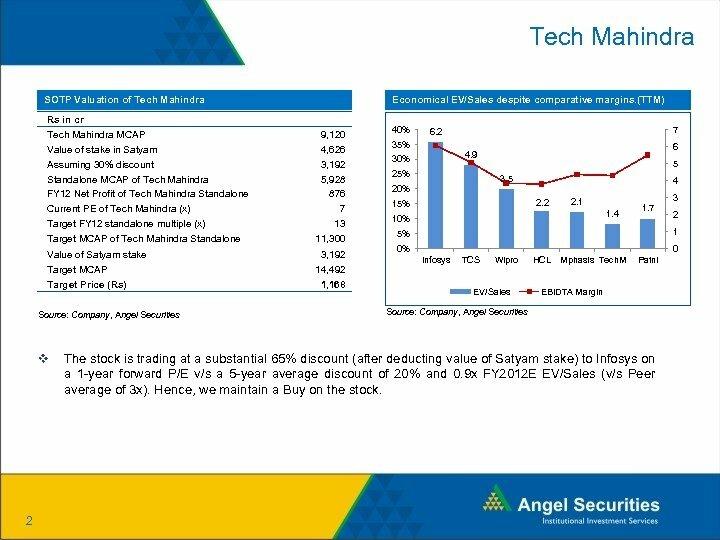 7 2 1 5% 0% 0 Infosys TCS Wipro EV/Sales HCL Mphasis Tech. 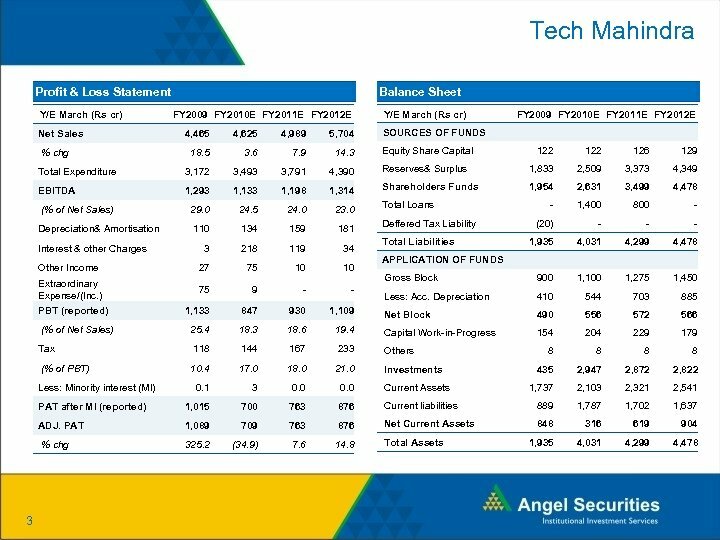 M Patni EBIDTA Margin Source: Company, Angel Securities The stock is trading at a substantial 65% discount (after deducting value of Satyam stake) to Infosys on a 1 -year forward P/E v/s a 5 -year average discount of 20% and 0. 9 x FY 2012 E EV/Sales (v/s Peer average of 3 x). Hence, we maintain a Buy on the stock.